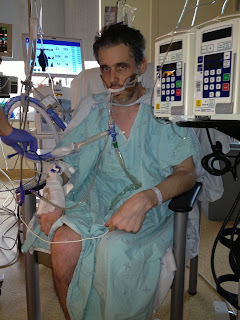 My blog about my husbands need for new lungs. 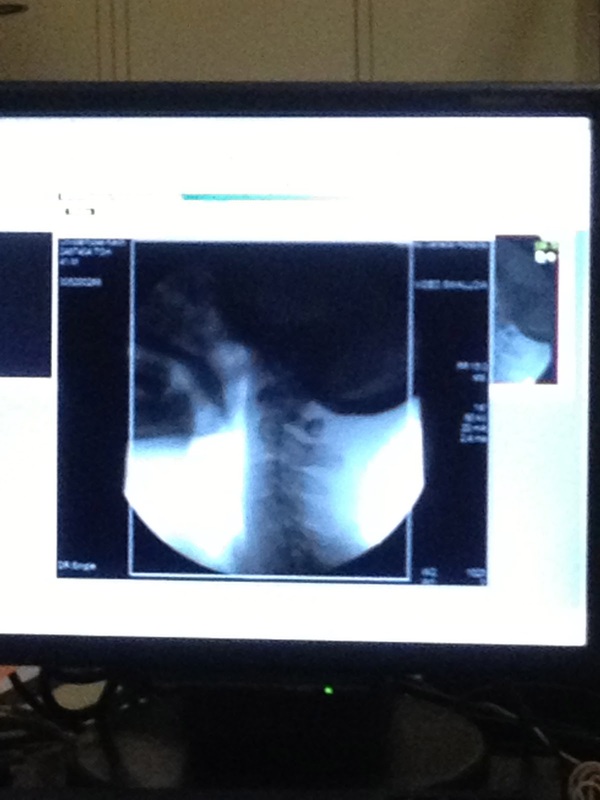 Beautiful lungs received on January 29, 2013. Be an Organ Donor! 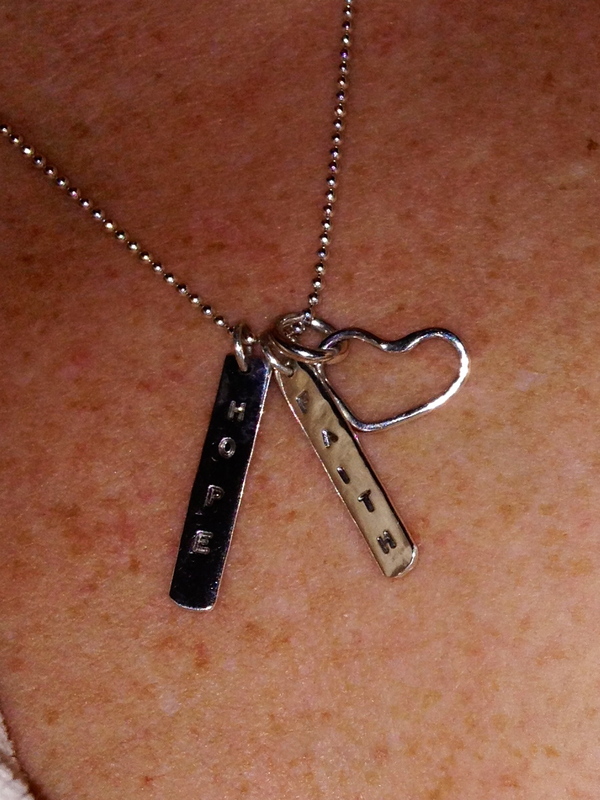 One Oakville woman's journey as she navigates the transplant system in Toronto, Canada. 3 years, 25,228,800 Breaths. These are the gifts that Keith has been given. 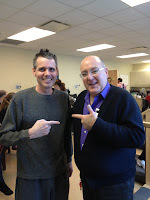 I was sitting in a waiting room at Toronto General Hospital, waiting for the word that the surgery was done, and that I could go and see Keith. That day was one of the most peaceful days of my life. I had been in a whirlwind for weeks, living with uncertainty and fear, but doing my best to keep things together - for everyone, but most of all, for Keith. We were in a no mans land, living each day wondering what the next would bring, not wanting to say what we feared, but knowing that it could happen any time. His body was done. His lungs were done. 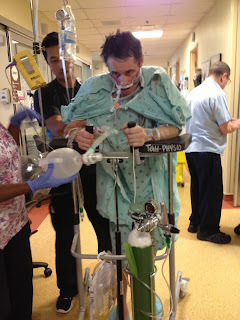 The doctors were pushing for ECMO and I was saying NO. His will was strong, he was so determined to keep going, that I wanted him to keep and use his own lungs as long as possible, until his hero came along. Days before transplant. His body was shot. Dr. Hsin writing "L" and "R" on his chest! Just to be sure the lungs were in the right spot! On the evening of January 28th, the call came in. There might be lungs. What followed, from about 10 p.m. until 6 a.m. was a quiet evening in the ICU room, with visits from time to time from nurses and doctors saying that they still didn't know if everything was a "go". 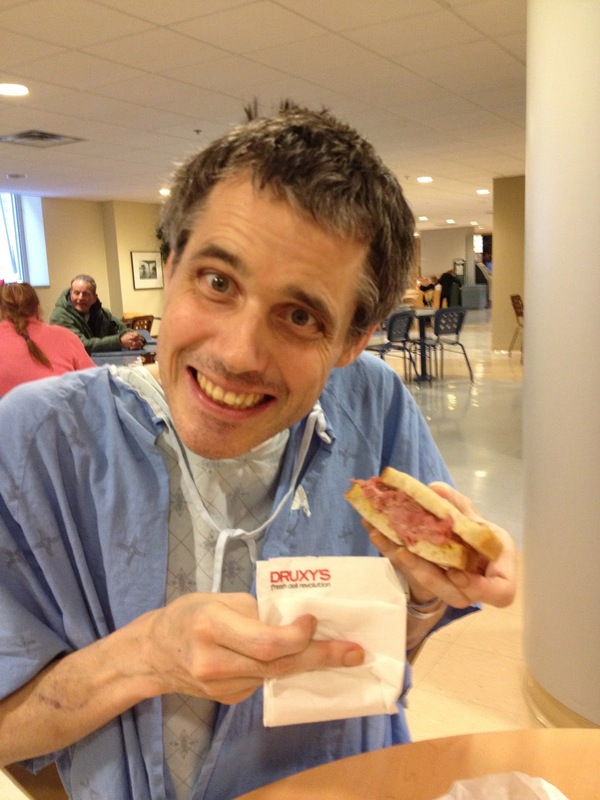 At 5 in the morning, everything was confirmed, and Keith was prepped for surgery. 7 1/2 hours later, Keith was out of surgery and by 7:00 that night I was holding his hand. Seeing him breathe again, knowing what had happened, knowing that he had been gifted with the most precious of gifts ever, filled me with so much emotion that it still brings tears to my eyes as I write this. Happy 3rd Lungiversary my darling husband. Here's to 25,228,800 more breaths, and more after that. Each one is a blessing. You too can be a hero. Visit beadonor.ca and register in Ontario. Healthy, Happy, and loving life! 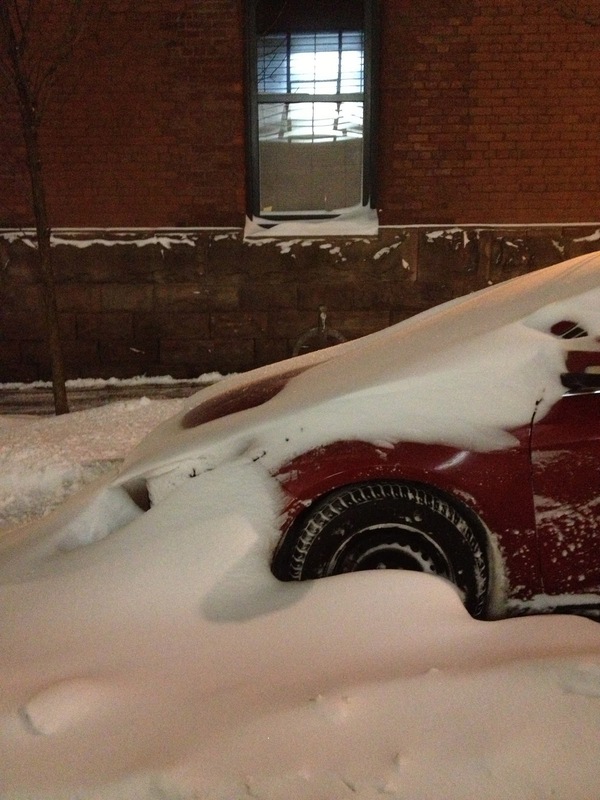 Spring Break - A different perspective. Our families come in all shapes and sizes, and as we know, varying degrees of "happy". With Spring Break coming to a close, I'm sure many of us are just as happy to come back to the grind, the office, school, and a "break" from all of that togetherness. The picture above could be any family, on a skiing trip - smiling for the camera as requested, and turning immediately after to bicker or complain about the cold, or who punched who on the car ride home, or who gets to ride with whom on the chairlift. I want you to look very closely at this picture above. Imagine you are seeing it and have to describe what is happening. Small little things start to stand out to me when I see it. Young Ryan on the left has his head raised ever so slightly as if he is really proud to be there with his family and perhaps is feeling pretty confident on the hills and about his expertise. Peyton has that sweet innocent smile that shows that she cannot quite contain her excitement about heading up the hill in order to be able to schuss down it (again? or for the first time? - we do not know from this picture if they have already been up although everyone is looking quite lovely and dare I say, even coiffed!). Todd and Tara are the proud parents, and Todd with his arm over Taylor's shoulder is showing how proud he is of his family. Taylor has that beautiful confidence that shows through her smile, and is leaning in towards the family. I don't know about you, but I do see true love in each and every smile in this picture. The family was on the trip of a lifetime at Beaver Creek Mountain in Colorado. 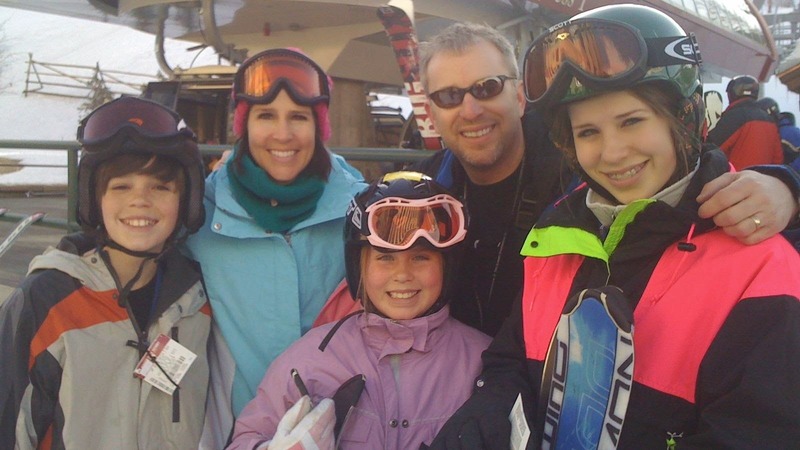 This was the first day of their family Spring Break vacation in 2010. The family was having a blast. They were happy. The last run of the day belonged to Todd, Ryan and Taylor as Tara and Peyton were pooped and went for a hot chocolate at the lodge. Taylor had learned to ski that day, and being an athletic and coordinated girl, was a "natural", said her ski instructor. That final run was, for this family, the moment when everything changed. Taylor lost control on her skis. Taylor hit a tree head on. She was wearing a helmet. The next day, Taylor was declared brain dead. "Would you be willing to donate Taylor's organs?" The response from both Tara and Todd was the same. "Absolutely! It's what Taylor would want". Kidneys, Pancreas, Liver, Heart and corneas. Life. To 5 different people this decision meant life. 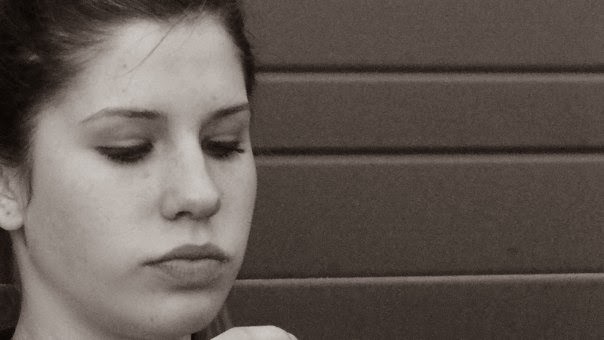 In death, Taylor Storch was a hero. In life, she was a generous, loving, and Christ centred soul. In a poem, written the year before she died, she describes herself as "outgoing and friendly" and specifically that she tried "to make every day like her last". As we read her words we cannot help but imagine this 13 year old girl, full of life and look at our own children on their Spring Break. Did they fight? Was every moment pure bliss? Did they hug you every chance they got? Did they tell you that they loved you? Did YOU tell them that you loved them? Was each day like your last? I saw Todd Storch's post today on Facebook where he shared the family image above. This image speaks to me. I see this family, and the intense smiles on every person and my eyes are drawn to Taylor's. Those stunning Taylor Blue eyes. Those eyes that look into that soul that did not know. It did not know that it was ready to share this "last day" with 5 other souls and give them life. Taylor did not know, her family did not know, but the Storch family honoured Taylor's wish in their grief. If you would like to learn more about Taylor's story, please consider reading Taylor's Gift which can be ordered through your local bookstore. Last time I wrote here, there was a new ring, a pending wedding, and Keith on a continued positive health trajectory. The wedding was a huge success, and we were able to celebrate with our families and friends in a way that would not have been possible without the gift that Keith had received earlier last year. 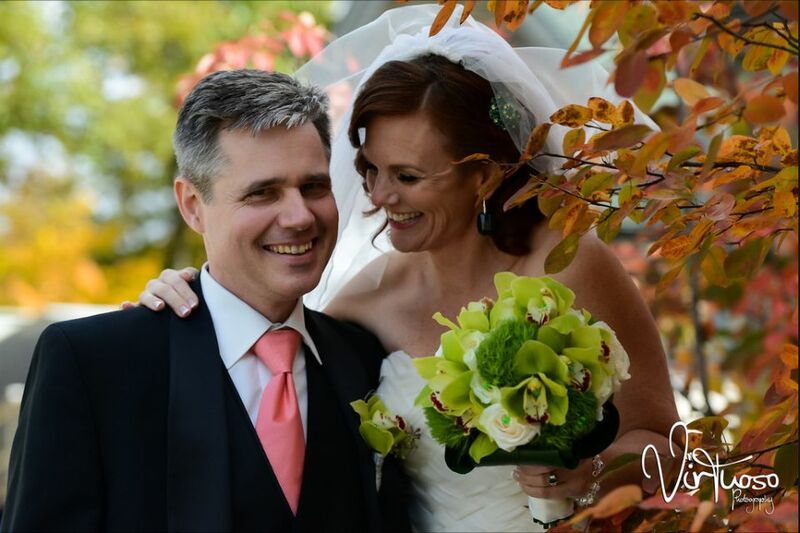 It was a chilly day in October, but the sun was shining, our family and guests were treated like kings and queens, and Keith and I could not have been happier. Keith's 1 year numbers were great. PFT (Pulmonary Function Testing) was 89% (compared to his 8% pre-transplant, and the average healthy person of 80-90%). He did his 6 minute walk and walked 718 metres, and all other standard blood workups were good. There was some concern about kidney function as his creatinine levels were up, but they have levelled off and are at a completely safe level now and the nephrologist has no concerns. We will keep an eye on the kidney function over the next year just to make sure that it is working as it should. 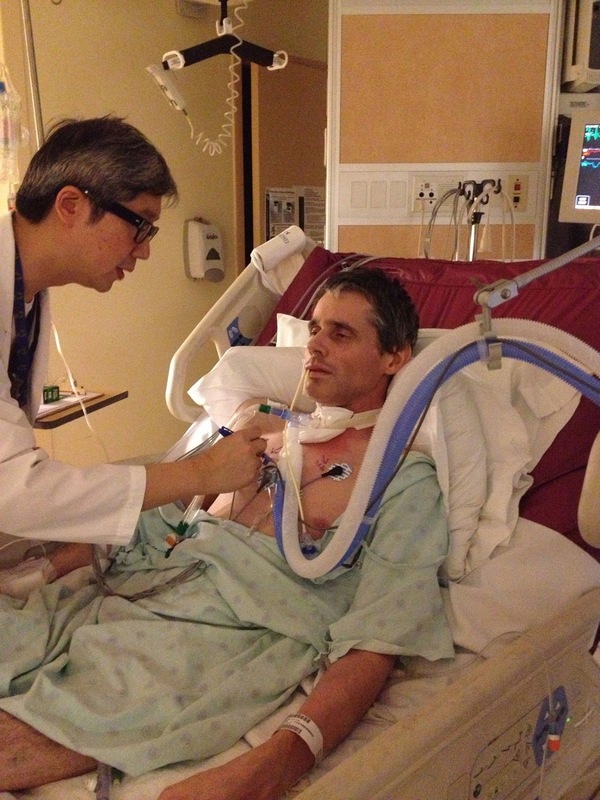 Essentially, all this means that these amazing incredible lungs, are working beautifully in Keith's body. 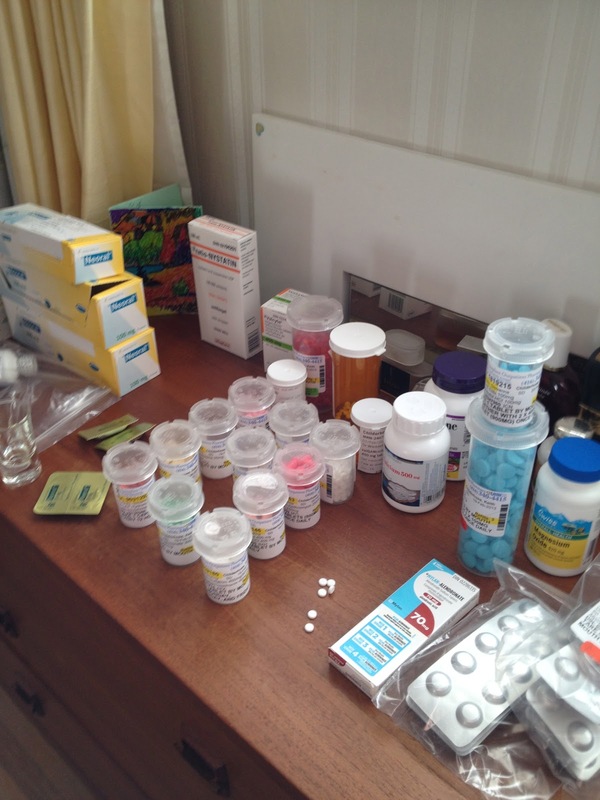 The medications that he takes to keep his body from rejecting the lungs, are working well to keep it all happy. Here is a link to the post that I put on Facebook on the day of his "lungiversary". If you haven't found the page and liked it, please do. It's a great way to connect with us. 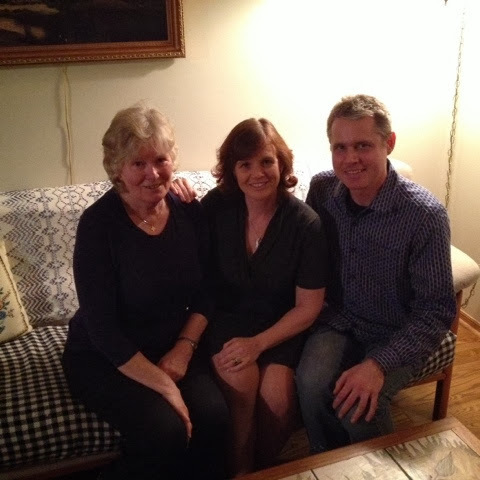 On the evening of January 29, 2014, we had the honour and privilege to have dinner at the home of Ruth Vibe, the widow of John Vibe who was Keith's donor. It is very rare in Canada to connect with your donor family from a deceased donor, but we have been so blessed by this friendship and connection. Getting to know the family of the man who is Keith's hero has been incredible. CBC did an excellent job sharing the story. See video here. Our local paper, The Oakville Beaver, continues to print excellent coverage of Keith's story. Here are links to their recent article and video. Thank you all, for your incredible outpouring of support and positivity over the past year and a half. 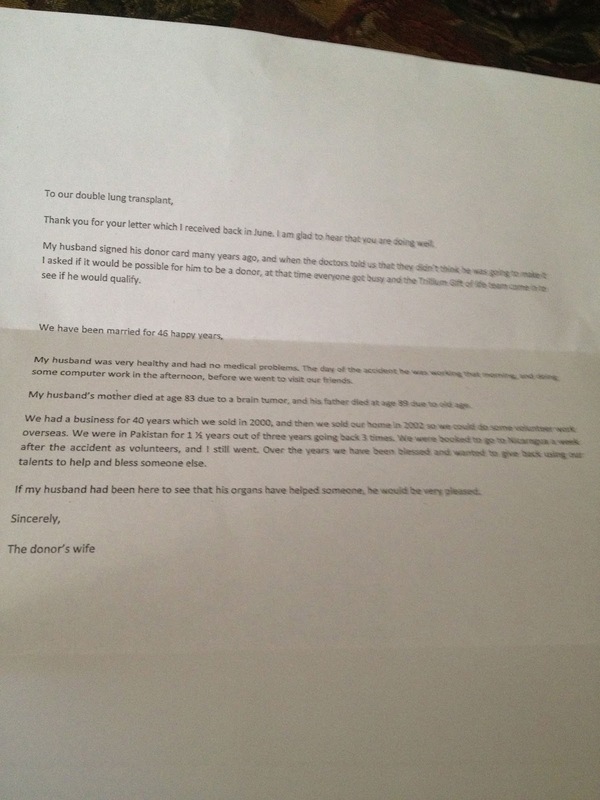 Keith is forever grateful to his donor, and to all of you for all of your kindnesses and practical help. This year, for a new years resolution, I resolved to share the need for organ donors with a stranger at least once a week. Share with everyone how Organ Donation saves lives, how they can be a hero also if they register at beadonor.ca, and share their wishes with their loved ones. Tell your loved one that it is important to YOU. A stone with a story. So, he proposed. Threw me for a loop, and I accepted wholeheartedly. How could I not. I had waited for this man to come into my life, and I had almost lost him. To know that he wanted our hearts to join in this way, filled me with joy that I cannot describe. A proposal typically includes a ring. In Keith's words "the transplant department had a very poor selection, so I didn't get you one yet". I forgave him. I will say that I am the type of girl that would want to choose my own jewellery anyway, and have Keith be part of the process. Green has been the colour of Organ Donation for years. It represents new life, and hope, and just happens to look fabulous on redheads (!) 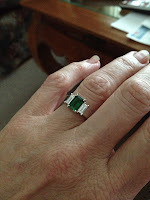 I was set on getting an emerald as a centre stone and began looking. The more I researched, the more I realized that an emerald was not the right stone for an engagement ring. It is a softer stone, it scratches and is prone to chipping on an everyday ring. Clearly, I needed to find another stone. One of my searches led me to discover the Tsavorite. 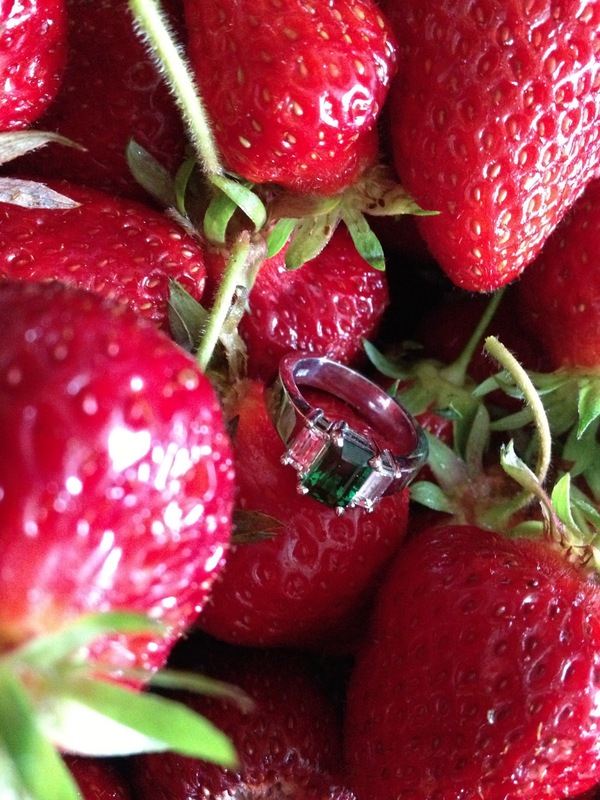 This stone, is a semi-precious deep green garnet, discovered and mined in Kenya and with an incredible story behind it. A sad story but one that speaks of perseverance, history, family and the desire to better the world that we live in. Harder than emerald, and a shade of green that speaks to me. It is clear, deep forest green with a clarity that causes it to sparkle in the sun. An email to the company connected me with Bruce Bridges, the son of Campbell Bridges who discovered the stone in the early 60's. 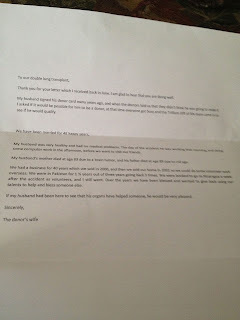 An email correspondence ensued, where I told him the story about Keith and pointed him to this blog. He was instantly interested in helping, understood my desire for a green stone, and we began the process purchasing the centre stone for my ring. For years, I had been wearing a ring that my mother gave me, with a lovely centre solitaire diamond and two smaller baguettes on the side. Since finances needed to be considered I asked my mother if she would mind me selling this ring, in order to help me get a new ring. With her blessing, I put that ring up for consignment and began to design my new ring. There is a little jewelry store in the Bronte Harbour area that has long been a favourite of my mothers. She suggested I go there to have my ring made. With my lovely new tsavorite in tow, and some pictures of what I wanted, I met with the jeweler a few times, and the ring was ordered. White gold, centre tsavorite with two baguettes on either side. Simple, timeless and clean. 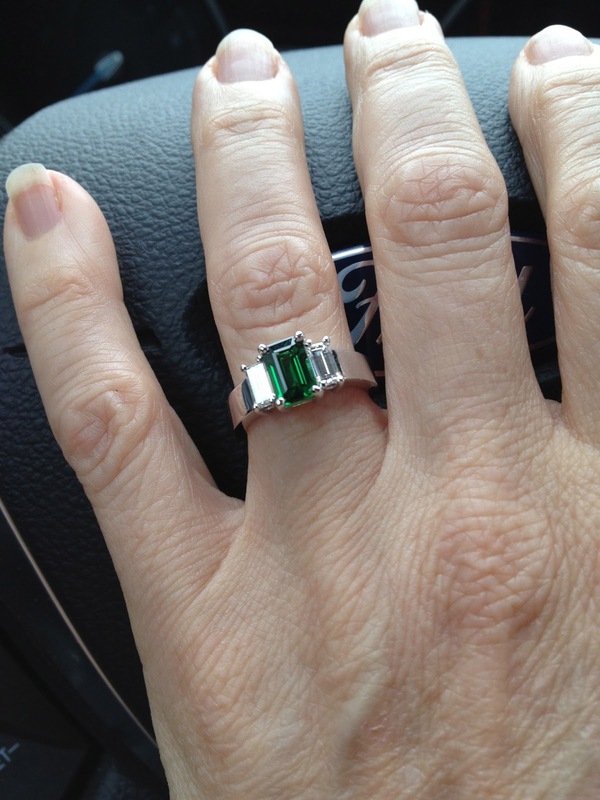 The tragic story of Campbell Bridges, the brilliant strong green of Organ Donation, and the clear and pure love that Keith and I share is what makes this ring so special to me, and to us. As promised, here it is. I love him, I thank his donor, and will wear this symbol of this love and gratitude with pride. Yes, by the way, I said yes. For one family, it is a date of sorrow. It is the day that their loved one left this world, but left it with a wish, with a request that any useable organs be donated, so that another can experience more life. For our family, this date is a rebirth. It is a father able to be there for his children, and a husband (fiancé) able to walk, once again, hand in hand, with his girl, for an evening stroll. The magnitude of this gift is not lost on Keith. There will never be enough thanks in this world, and each and every breath he takes, is a breath of gratitude. 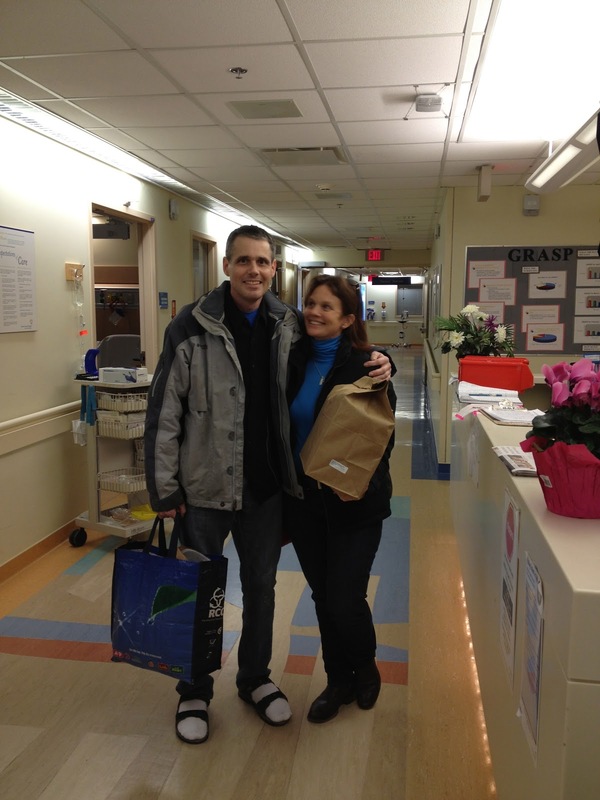 This post was begun on January 29th, 2013 - Over two months ago when Keith had just received his gift. The timing in posting it now, stems out of respect for the family that have lost their loved one, and because these last two months have been focused on taking care of this precious gift, and ensuring that it continues to keep Keith as healthy as it can, for as long as it can. I have come back to this post so many times, with the hopes that some lightening bolt will hit and I will have the perfect words. It is when I wish we had a language that had 1000 different words for thank you, and one word was just right. Our thank you encompasses all of the above and more. Our thank you sends prayers and hugs and blessings to the family who have lost their loved one. Our thank hopes that you take comfort knowing that this gift will be cherished. Keith and I want to let you know that we will always feel joined with your family. Keith is not a writer, but we have discussed how to say this, and I hope that I do justice to his thoughts here. When I wake, in the first few moments my thought is one of peace. Peace that I had not known for many years. I feel a level of comfort that my body had not been allowed to feel, and each fibre and nerve and muscle in my body is responding with a resounding chorus of thanks. Breath is effortless. I confess to having moments where I don't even think about breathing, which for someone with less than 10% lung function is an impossibility. I love my new lungs, I so appreciate that you supported your loved ones choice, and my children, my friends, and beautiful fiancé thank you for saving my life. 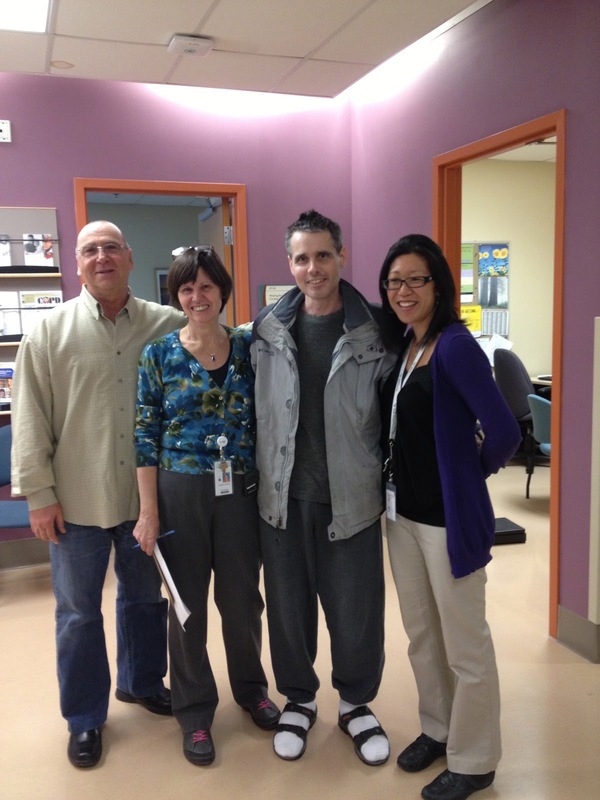 After nearly 3 months as an inpatient, either at WestPark Healthcare Centre or at Toronto General Hospital, and 12 days on a ventilator prior to receiving his gift of life, Keith was finally allowed to go home! It was so nice to be able to walk out of hospital, and into his home with NO walker! Our first night home, Keith really wanted to have Il Fornello pizza, so we went out and had a lovely meal with my daughters, Emma and Kathleen. CBC interview on Saturday morning. On Saturday morning, the CBC came to do an interview and finally get a chance to chat with Keith outside of the hospital. Keith did an excellent job. See the interview here (15 minutes in). 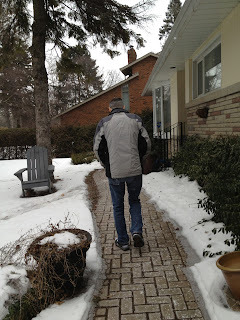 Our new reality, for a few months, is 3-4 regular trips in to Toronto a week for physical rehab, doctors visits, testing and follow up appointments. Keith is monitored very closely by his doctors, and does self monitoring every day through spirometry readings, temperature readings, and everything is charted. If there are any noticeable (10%) up or downticks in anything, he is to go to the hospital immediately. The medications that he takes to suppress his immune system, need to be taken at the same time each day, twice a day, for the rest of his life. Treadmill. 1.8 as opposed to .6. He rocked it. It has been so wonderful to meet up with many of our friends, and people who have helped over the months and years. Yep, another front page from our local paper. 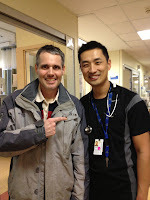 Vince - the Physio master in MSICU. No post would ever be complete, without thanking the one incredible person who made this all possible. You made a choice, your family supported that choice, and not one moment, not one breath goes by that is not filled with gratitude for your most precious gift. Thank you, from the bottom of our hearts. I can only hope that your family can find solace in knowing that Keith will take amazing care of this gift. If you would like more information on how to ensure that you are registered in Ontario as an organ donor, please go to beadonor.ca. Or visit Keith's Facebook Page and check out the about section for more links in other provinces and countries. Keith and I have known each other for over 6 years. We met online, dated for a few months, and then circumstances found us in a position to buy a home together MUCH sooner than we expected. 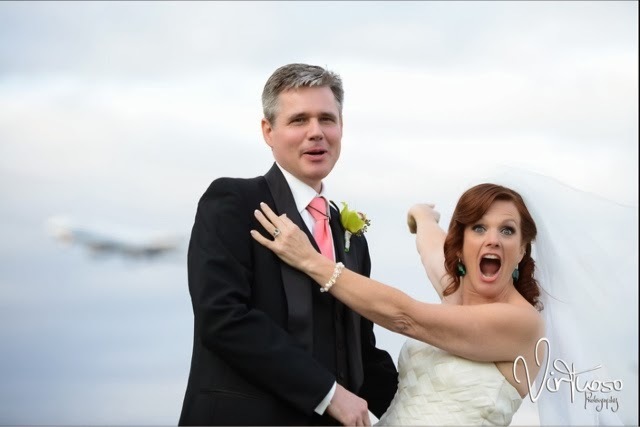 We threw caution to the winds, bought a house together, started a business together, worked amazingly well together, and were the best of friends. Inseparable. Over the years, we settled in to a wonderful sort of sympatico - we got along exceptionally well, rarely fought, but when we did it was with good conversation and communication, and as for things related to his health concerns, I ensured that I was as informed as I could be, so that I would be his closest and most effective advocate, should the need arise. As you all know, the need arose. And I rose to the challenge. You have all followed Keith and I over the past month as things escalated to the point where I was seriously concerned that my best friend was going to be gone from my life. I never wavered in my efforts to help him, and to help others. There was no other choice for me. This morning, I donned my only colourful item of clothing (hot pink), and went to the hospital. Keith was not feeling well, had not had a restful night, and was in a lot of pain. My first hour there was spent ensuring that he had hot water bottles for his sore arms and shoulders, and that his pain meds would start to kick in. I let him rest in bed, and I was working at the computer when he told me that he wanted to reach over and touch me. He had to push his table out of the way, swing his legs over the side of the bed, and I saw him grimace as the movement caused his pain to come back. He walked two steps to where I was, and lowered himself down onto one knee. As he took my hand, I looked at him and he very simply asked "Will you marry me?" As an aside, throughout this and for the past few years, I have always referred to Keith as my husband. For all intents and purposes, he is. We are common-law, and in the eyes of the government, we are married. 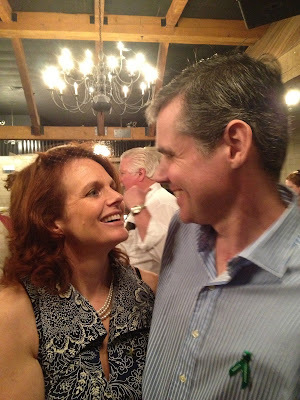 Keith and I both came from previous relationships, and certainly for Keith - he had no interest nor need for any sort of formal declaration or paperwork in order to prove how he felt about me. Over the past few years, this has come up, and it was the one thing that he would not budge on. We both agreed that this was the status quo, and that what really mattered - was that we were together and loved each other. My first reaction was "are you serious?" - romantic huh? 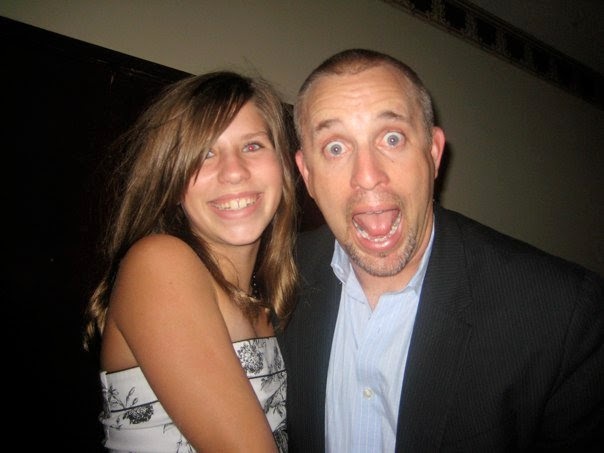 But really, this man had told me repeatedly that he would NEVER get married again. He had made friends promise to take him out to the barn if he ever did this again. Thankfully, his two best friends have been informed, and have promised NOT to follow through on their promises. I asked him why he was doing this, and he said it was because he really wanted me to be his wife. He had had a lot of time to think while he has been going through this whole ordeal, and told me that he was so amazed at how I had handled the past few months, and the past month in particular. He has been given a new life, and he wants to spend the rest of his life with me. I said "yes." I love him. Somewhere out there, there is a family that I have to thank for this. Thank you so much. I wish that I could find a way to tell you how much this gift means. I hate that it came at such a price for you - it is my daily prayer that you can find peace and know that your loved ones lungs are cherished. Two weeks post transplant. Ups and Downs. To bring you up to date, I thought I would post an update with some of the things that have happened this past week. 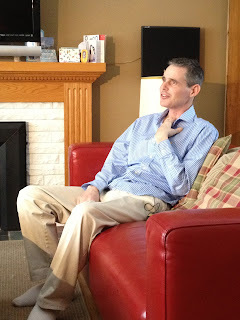 Keith was assessed with a swallow test a week ago to see how he was swallowing (after having been intubated for a week, and on a trach tube after that, it was imperative that he was swallowing food, and it was going down the right tube! All looked pretty good, except for a few bits that weren't making it to the right spot, so he was put on "similar consistencies" for food choices. No nuts for this guy for a while! 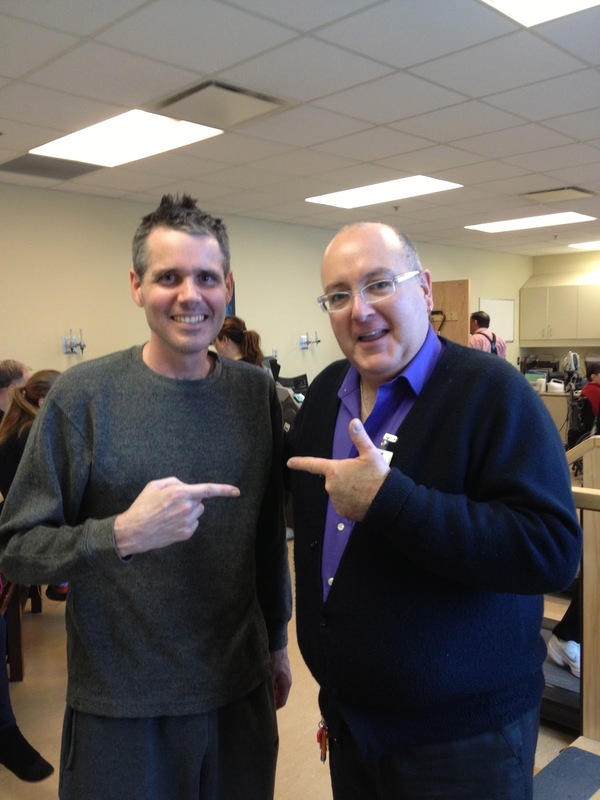 On Friday evening, a nurse came up to Keith and I in the hallway and said "I've been reading your blog!" to which Keith smiled in his new "I'm kind of a rock star now" way, and chatted with her. Her name was Roxanne, and she wanted to come by the following day with a couple of her students and change his chest dressings. Bring it on. What a great girl and she and two students (one from DeVry and one from Sheridan) took great care with Keith and got his dressings all cleaned up. The nurses here are awesome. Sunday was an exciting day. 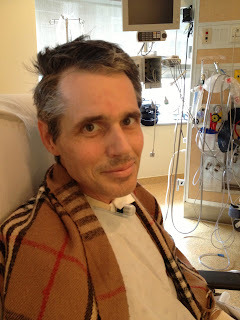 Keith said goodbye to his trach tube in the morning. Dr. Leanne Singer did the honors, and later in the morning Keith's nurse Christine tidied up the trach site and covered it up with a bandage. This was crucial because it was visiting day! Keith was pretty excited when lunchtime came around, and we decided to head down to the food court and grab a corned beef sandwich from Druxy's. HUGE joy on his face as he ate the first "non-hospital" food in weeks. Later on Sunday afternoon Keith finally had the opportunity to see his kids who he has not seen for over 4 weeks. They were overjoyed to see him and have a lovely long chat in the atrium here. Bobblehead Yoda and Darth Vader were gifts, along with some great handmade Get Well cards. I know that it was wonderful for Keith to finally see his kids after all of this, and to give them all big hugs. They are so appreciative to have their Dad back, appreciative of the incredible gift that he has been given, and that they get to enjoy. It is times like this that we truly remember the circumstances surrounding this gift. 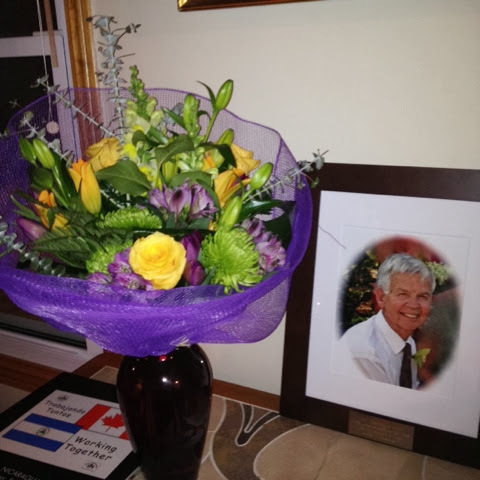 The thanks extends beyond Keith, and I, it is a whole family and friend network who are thankful each and every moment for the gift that he has received. On Monday, Feb 11th, Keith experienced some issues with an elevated heart rate, reduced oxygen and was feeling feverish (although did not have a temperature). The doctors did an x-ray and EKG and determined that it was possible he had an infection, which they are treating with a broad spectrum antibiotic. By today he was feeling slightly better, although the pain of the incision site is still strong. Medications manage this for the most part. 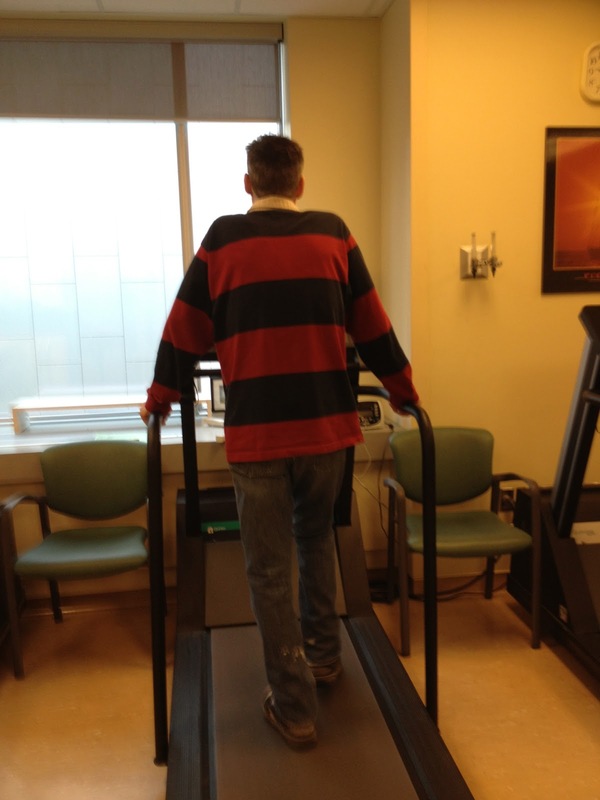 He was out for a 6 minute walk test today, and walked 325 metres. I'd say he nailed it! The Facebook page continues to grow, and be a place where we can share the daily goings on for Keith. While I try to post as often as I can, Keith's rehab is the priority right now and I cannot always post there. What is amazing, is the number of people who have messaged me privately to ask how Keith is doing, and offer help. Many of these people are students who have been touched by Keith's story, transplant patients both pre and post who remember how it was for them, and people who are moved by the importance of organ donation. People who never thought about it before, but having heard Keith's and so many others stories, are moved to make a difference. As we continue this journey, we will continue to ask everyone a favour - the next person you are talking with, whether it is the teacher at your child's school, your parent or relative, or a stranger you are helping on the street, - please remember that there are thousands of people waiting for organs in your province - your country. Even a simple conversation about how you have been moved by this story and are trying to raise awareness about the importance of double checking beadonor.ca in Ontario to see if you are registered. We CAN make a difference and raise the numbers of people registered. If you tell one person each day, who tells one person, more people will have the conversation and we will continue to spread the word. Has it really been just 10 days? How is this even possible? Three words. 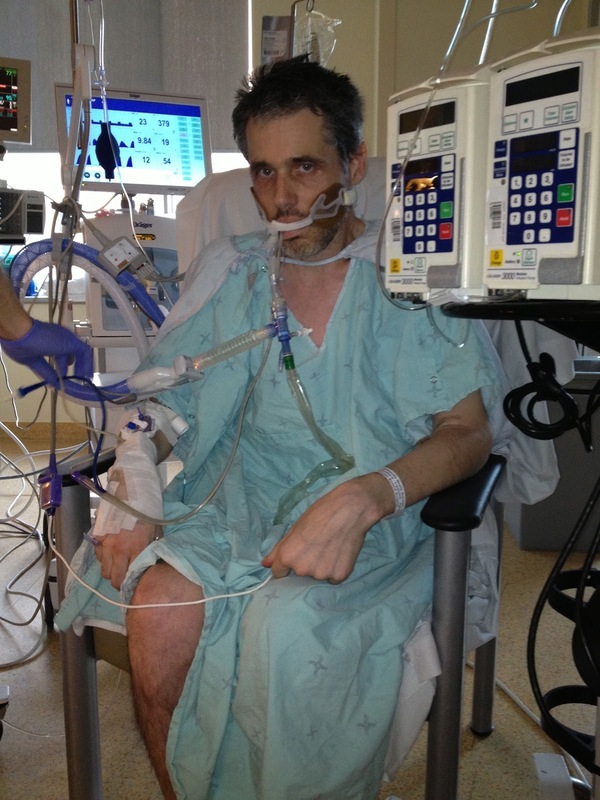 On January 17th, Keith was brought to TGH, on a ventilator, unable to speak, his body ready to give up. Years of deterioration and infection had rendered his lungs completely unable to power his body anymore. 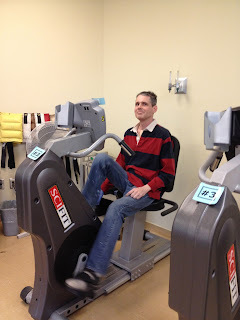 Keith had the will to continue, but his body was not cooperating. For 12 days, Keith was in and out of coherent thoughts. Days went by when he was merely a shell, with a machine that breathed in and out for him, his mind addled by medications and his body fighting to keep him here. When I was with him, I was strong. When I spoke to family and friends, I was strong. The nurses, media, and strangers couldn't believe how I remained calm, dignified, and even smiled and laughed when I was with him. How did I do it? A few weeks before Keith was admitted, an old school friend told me she wanted to give me something. A talisman. I admit, I figured I was going to get some smooth rock carving made by an inuit. I had no idea. Two days after he was brought in, she brought by my present. It was a simple silver chain, with three charms on it. I'm a pretty simple girl when it comes to jewellery. I've worn the same gold chain for the past 13 years. I took it off, and put this on. I touched each talisman and said the words to myself, and then out loud. This is what would get me through. Love could continue. My mantra continued throughout each day. It charged me. It propelled me to continue to move forward. Faith. Hope. Love. On January 29th, Keith received the gift of life in the form of a pair of gorgeous (I have on good authority) lungs. A simple decision that was supported by a family. There was Hope. My Faith continued to give me strength. My Love for humanity grew. Keith is now in a room down on the 7th floor, less supervision, fewer bells and whistles connected to his body. No oxygen during the day, (possibly at night). Two chest tubes still in and his bad sense of humour firmly intact. Now our hospital days are spent doing more walking, follow up doctor appointments, x-rays, more follow ups with doctors, getting some much needed rest (it's a much quieter floor than the 10th!) and healing. Every day is a gift. Every moment is precious. And yesterday, Keith finally asked me about some timelines. He wanted to know why I was saying that he had been in the hospital for three weeks. I had to tell him that he had been here for 12 days, in and out of consciousness, and that I had been by his side for the entire time. He looked at me, puzzled, and began to weep. "How did you stay sane? ", he asked. I pointed at my necklace. "Faith. Hope. Love. There was no other option for me, I have you back now. Eternal gratitude to the donor. 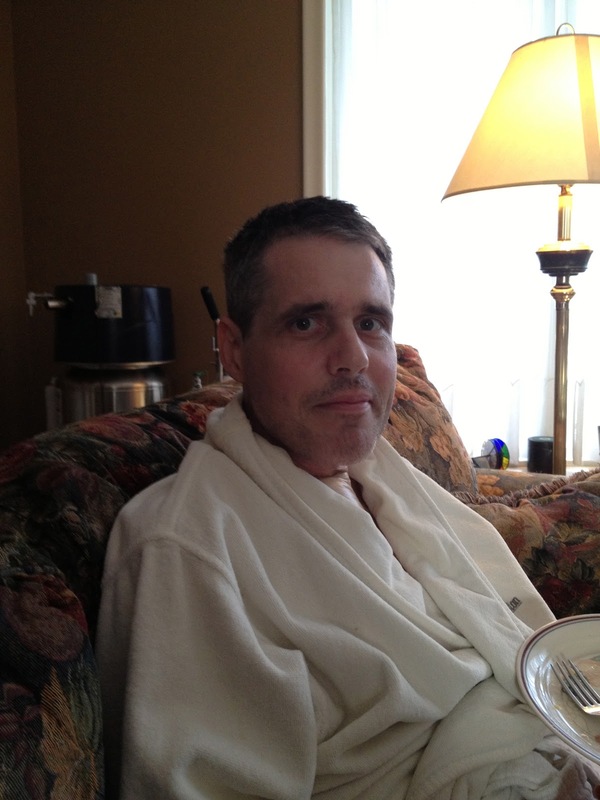 Keith received the gift of life on January 29th, 2013. In a quiet evening and overnight, of reflection and anticipation, the gift was confirmed, and surgery began in the morning of the 29th. The surgery took 7 1/2 hours. 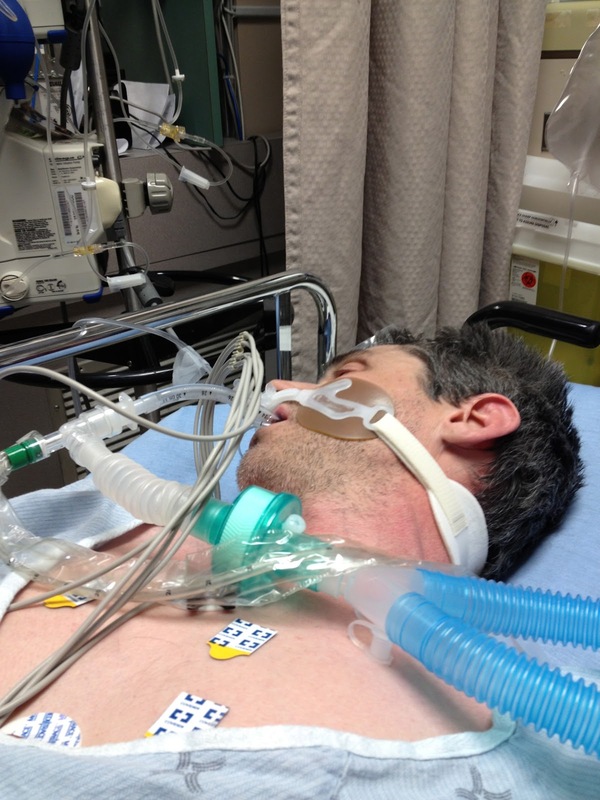 Three hours post surgery, Keith was extremely pale, fully sedated, and breathing with the aid of a ventilator from his trach tube. Having the trach, which he had received 3 days before (after a week on the ventilator) was a bonus as it meant that when he did wake up from the surgery, it would be an easier transition off the ventilator because if need be, he could be put back on with no need for intubation (through his mouth). As I sat beside him for a brief time, and held his hand, and watched him resting, his chest rose and fell, in deep full breaths, and the magnitude of what had transpired hit me. There were new, donated, precious lungs in his chest. They were alive. Blood was travelling through them, oxygen was being converted to carbon dioxide and was ensuring that his body continued to function. A team of brilliant, talented and caring surgeons, specialists, doctors, nurses, orderlies, physiotherapists, nutritionists, coordinators, psychologists and countless others - had made it happen. 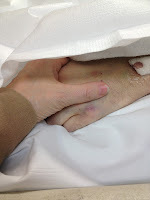 My husband was right there, beside me, with warm hands and a strong body that I knew, was bound and determined to heal. The following day, (lets call it Day 1) Keith was woken up approximately 10:30. It was my first look at him, in the eye, and when I did look at him, I knew that he knew. It had happened, and he was still there. While he wasn't smiling, he was still adjusting to a whole bunch of medication that keeps you pretty messed up for a while. He had also regained his colour and looked like the man I know! Slowly, he began to get his bearings. His neck was quite stiff from being in one position for so long, so his nurse and I were trying to encourage him to move his head left to right. I was sitting on one side of the bed and encouraging him to look at me and move his head. His first note to me at this point (as he still could not speak) was that I was "too short" for him to look down at me. He's baaaaack! He was quite tired, understandably, so Day 1 was spent encouraging him to breathe in a new way. 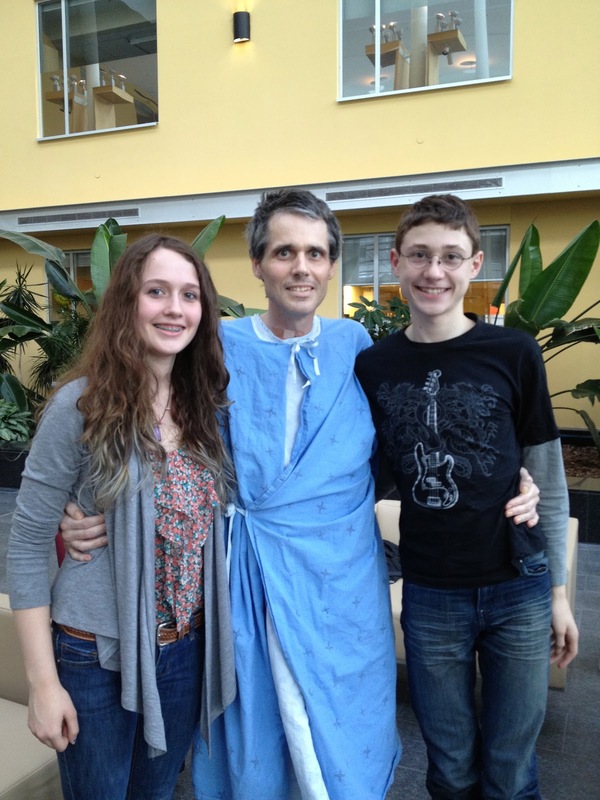 Pre-transplant, Keith's breathing was quick and shallow, as that is all his lungs would allow. If you have been breathing a certain way for many years, your mind thinks that is how it has to breathe. We need to teach his mind a new way of breathing. Deep breath in...HOLD...full breath out - repeat. I did my best to practice deep breathing with him for a while, however drifting in and out of sleep, combined with the beginnings of some hallucinations, made it a challenge. 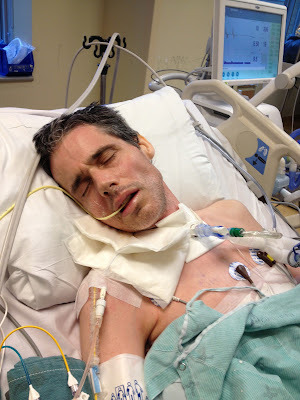 He was still on the ventilator when I came in the morning, but was removed from it at 3:30 to allow him to begin to breathe on his own, through the trach tube. When I left at 6:30, the nurse said he would likely be put back on it overnight to give him a break. I also learned that morning, that he had never been put back on the ventilator! This was amazing news. 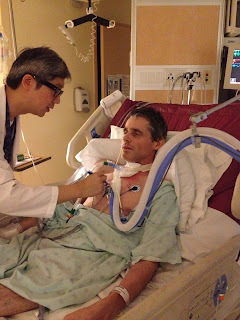 He had been on 32% oxygen overnight (which is 10% more than you and I take in) through the trach mask. He had been breathing, on his own 24 hours after his operation. Day 2 was spent continuing to encourage him to do his breathing practice, lots of deep discussions with him about what a gift he had received, and additional interesting notes from him about the "goings on" in the hospital. I wont go into detail here about some of the hallucinations that he was experiencing, that will be another blog post. However, for those reading this who are waiting for transplant, be prepared. Some pretty crazy stuff happens in your head. Keith got frustrated at times when I could not understand what he was writing (because a lot of it made absolutely no sense) so I did my best to stay positive and keep him happy. He rested a lot. He also began to fiddle with his NG tube (feeding tube that was in his mouth, going directly to his stomach) and chew on it constantly. No amount of telling him not to was helping. He did NOT want it in there. It was his only source of nutrition so imperative that it stay in until the doctors said it was okay for him to eat on his own. 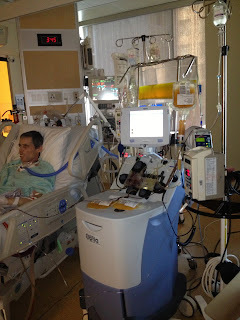 Once a day, Keith receives plasmapheresis. See the WIKI on the link under this photo. Essentially, it is a transfusion to remove his blood, spin it to split the plasma from the blood cells, and reintroduce it with new plasma. This is done because Keith has a high number of antibodies in his "original" blood. He had multiple sessions of plasmapheresis during his 7 1/2 hour operation. 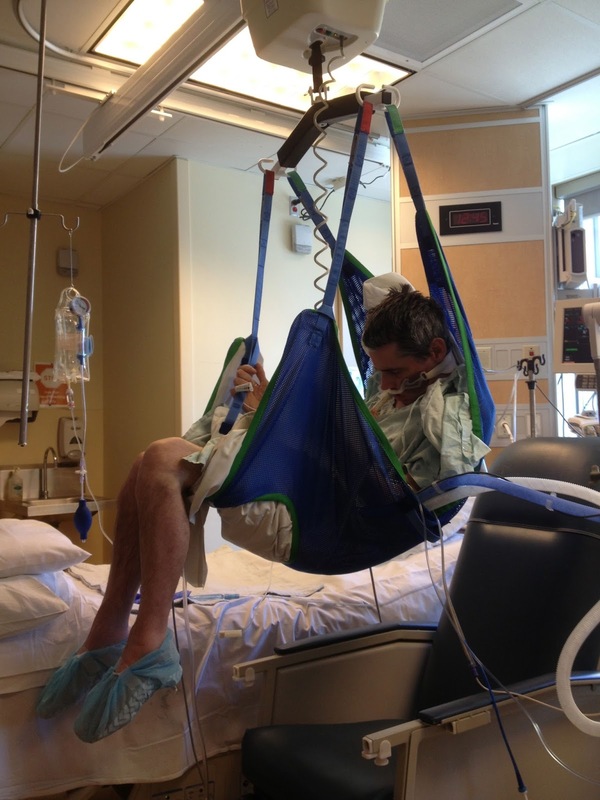 The process takes about 1 1/2 hours each time, and he will have it for 5 days post transplant. Keith had decided that he did not like the NG tube in his mouth, and had removed it overnight. While it was lovely to be able to come in and kiss him properly, the nurse promptly inserted a new one so that he could get his feeds. He was extremely confused this morning. Again, the hallucination post will be done when I can discuss it with Keith. I certainly don't want to seem like I am "making fun" of this period of time. While it can be amusing, the patient truly believes that these things are happening to him. I had to manage it so that Keith knew that he could trust me, and that I would ensure that he was always safe. 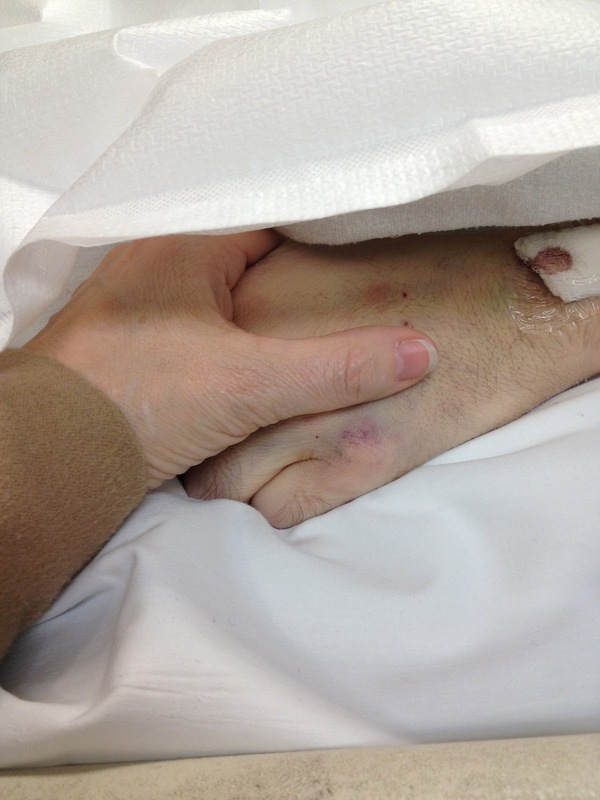 I reassured him that everyone was taking great care of him, loved him, and only had his best interests at heart. By the middle of the day, he was more lucid, and we had a good discussion about where he was, why he was here, and how well he was doing. He sipped a little on water and a small medicine cup of coffee!!! The look in his eyes. Wish I'd taken a picture of that. Day 4 - Eating and Talking! After a terrific nights sleep, Keith has had a great day so far. He has had his trach tube reduced (yesterday) and can talk when he covers it with his finger. He's a little breathy (think the Godfather, but without the threat of a cow head) but understandable if you are close to him. I took a chance and brought him up a Tims coffee this morning. Worried it might be contraband, I covered it on my way in. 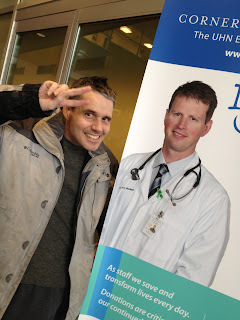 When the nurse gave me the OK, I showed it to Keith. He was overjoyed. We figured out that adding coffee to the liquid nutrition drink was the perfect high calorie, nutritionally sound "cappuccino", so we went for it. Shortly after his morning "meal" (the first food by mouth in 16 days) he went for a tremendous walk. He walked the whole floor, waved to people, and smiled at all the ladies. There are lots of ladies! 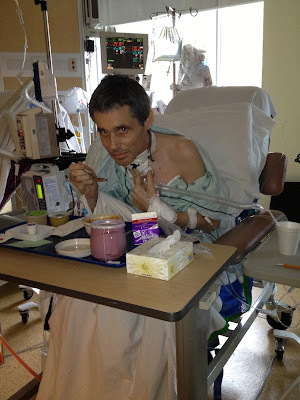 We got back to his room and got him settled in his chair and early afternoon he was brought his first meal. For someone who used to take 2 hours to eat a meal, he completely surprised me. He was done in 10 minutes. Absolutely blown away. Watching him eat so quickly was absolutely incredible. He was hungry! That brings us up to date. I'm taking a breather, and he is having a nap. Our continued blessings and thanks to the donor family.